Welcome to our May/June 2017 issue — one that we hope will serve as the blueprint to the start of your New England summer art wanderlust. We had already planned to cover the opening of the Frank Stella “Prints” retrospective at the Addison Gallery of American Art, but when the offer came for a chance to interview one of the world’s most beloved artists, Flavia Cigliano had no problem rearranging her schedule. Her extensive report on the show leads nicely into Suzanne Volmer’s review of “Matisse in the Studio” at the Museum of Fine Arts, Boston; not only is it a once-in-a-lifetime opportunity to see many of Matisse’s works, but also some of his own favorites from his personal collection. Similarly, Elayne Clift brought a powerful personal view as she shares her experiences of traveling to Boston from Vermont to see “Memory Unearthed: The Lodz Ghetto Photographs of Henryk Ross,” also at the MFA. The show of soul-reaching images that were literally unearthed after decades of being buried in a hidden location is a reminder of the importance of photography in telling stories of otherwise untold horrors that have, and continue to, take place on our planet. With the prospect of major changes to our country’s environmental laws an ongoing concern, the writings of Henry David Thoreau are as essential now as they were when first written in the 1800s. James Foritano traveled to Concord to see two shows that are taking place at the Concord Museum and the Concord Center for the Visual Arts that are tied to the year-long Thoreau Bicentennial. Similarly, the University of New Hampshire’s Museum of Art is celebrating its 150th anniversary with “Closer Readings: New Hampshire Writers Respond to Art,” pairing the writings of UNH-affiliated writers with works from the museum’s permanent collection. Linda Chestney reports on the end result which, as one would expect from the Granite State, resulted in a show heavily based on an appreciation for nature. The Ogunquit Museum of American Art recently hired Michael Mansfield, who had previous been a curator at the Smithsonian American Art Museum, as its new director; Artscope’s Eric Taubert interviewed him just prior to the start of their 2017 exhibition season that includes an exhibition serving as a celebration of the life of Dahlov Ipcar, who passed away earlier this year. We’ve got reviews and previews on a number of solo shows worthy of a road trip in the months ahead. Taryn Plumb interviews Catherine Worthington about her “Textile Translations of Maine” exhibition at Monkitree in Gardiner; the aforementioned Volmer checked in with Paul Forte and Shey Rivera Rios to talk about their upcoming shows at the AS220 Project Space in Providence; and Don Wilkinson visited Nancy Hayes in her home studio prior to the opening of her “Anatomy of a Small Universe” large paintings show at Groton School. If you’re going to be in northern Vermont, Catamount Arts is going to be hosting “Pastoral,” a tremendous collection of sculptures by Nick Edmonds; Elizabeth “Beth” Neville got an early preview of the work in Massachusetts before they were packed for shipment to St. Johnsbury. Also in Vermont is “Notes from the Underground” at the Castleton Downtown Gallery in Rutland, featuring the work of Elizabeth Michelman (her writing is missing from this issue due to her preparation for the show); she shared the details with Vermont correspondent Marguerite Serkin. Two shows not to miss in Boston’s SoWa District this May include Francebased landscape painter Philippe Charles Jacquet’s heavenly, surreal “un temps arrêté” exhibition at M Fine Arts Galerie, previewed in these pages by Lisa Mikulski; and “Spazuk: Hubris, Beauty & Greed” at Adelson Galleries, where Molly Hamill attended the opening. Spazuk works in “fumage” — an exercise in which he runs his pencil over a flame before putting it to paper, resulting in trails of soot. Throughout our 11-year existence, we’ve regularly covered the work of Donna Dodson, whether solo or in cohort with husband Andy Moerlein as “The Myth Makers.” As I’ve gotten to know them, I’ve learned how much time they spend not only making and exhibiting their own work, but putting on events to bring artists together or heading out on the road to support other artists at openings or studio visits. From here on in, each Artscope will feature and conclude with “Donna Dodson’s Making Connections” — a column in which Donna will take you along on one of her latest adventures. 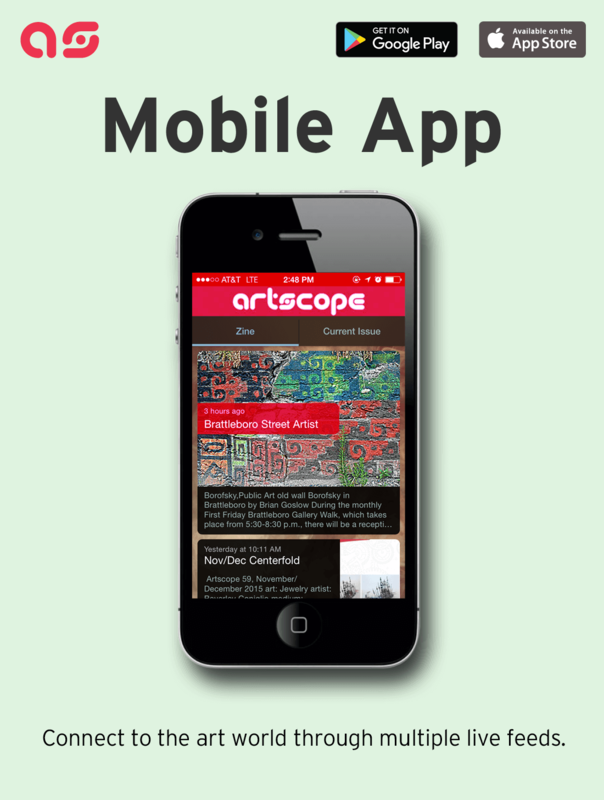 We hope it’ll provide you with another way of looking at New England’s artistic community. We continue to actively sponsor exhibitions and events around the New England region; one current show, “New England on Paper: Contemporary Art in the Boston Athenaeum’s Prints & Photographs Collections,” is reviewed by Franklin W. Liu; right as we’ll be going to press with our next issue, we’ll be lending our support to Shih Chieh Huang’s “Reusable Universes” exhibition that opens on June 24 at the Worcester Art Museum. For a number of years, we’ve attended the International Encaustic Conference in Provincetown, meeting hundreds of artists over the first weekend of June. We’re glad to have Laura Shabott previewing the “Photosynthesis” exhibition that will be taking place simultaneously with the conference at Julie Heller East; she also takes an in-depth look at the “Expressing Freedom: Transcendence Through Art” show at Miller White Fine Arts; it opened in conjunction with the start of the first ArtSpring Cape Cod, which is benefiting from the enthusiastic support of gallery owner Susan Reid Danton. We put great importance on building symbiotic relationships and are always inspired when we hear that someone benefited from our coverage. Last summer, Kat O’Connor was featured on the cover of our July/August issue, attracting the attention of Robert Reynolds of Reynolds Fine Art. The end result is her first show in New Haven this May; I visited O’Connor at her Worcester home studio to talk about her unique process of water-centric paintings. Those are the kind of connections we aim to make when we return to Basel, Switzerland on June 15-18 for our third year as an exhibitor in the Magazines Sector at Art Basel. 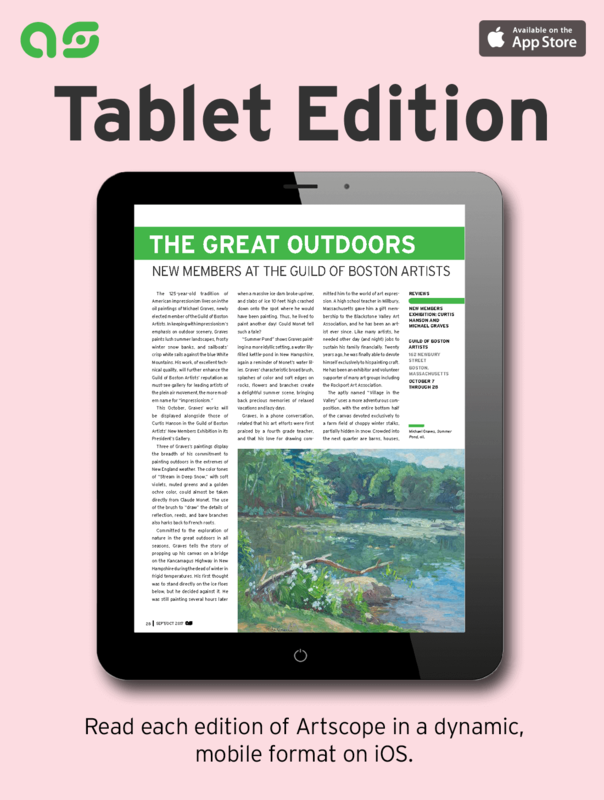 Not only are we able to bring you a look at the hottest work in the art market today — via both our magazine and social media coverage — but by building a relationship with the galleries in attendance, we’re introducing them to our magazine and the New England artists, galleries and museums that we feature.